Art can sometimes be taken so seriously that all the fun is dragged out of it. If you tend towards a more playful approach to life, or if you are an art loving chess whiz, you will definitely love the Xul Solar museum. 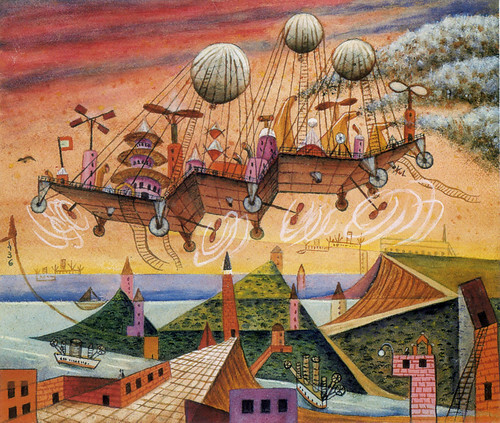 It not only exhibits this artists colorful metaphysical dreamlike paintings, but also some of his nutty but brilliant inventions, such as a new global language (he would have loved the internet! ), and the Panjuego, a game which he made up and played with many of his friends including Borges whose books he sometimes illustrated. Unfortunately for us, as the game changed every time it was played, there are no rules that specify how to go about it, otherwise we would be more than happy to challenge you to a Panjuego tournament in this lovely intimate art museum on a rainy afternoon! This entry was posted in Uncategorized and tagged art museums, Barrio Norte, buenos aires,, games, latin american art, Off the beaten path, xul solar by Fierro Hotel Staff. Bookmark the permalink.